The DP63400 series has been discontinued. Please see the Platinum Series as a possible alternative or contact our sales department. The DP63400 Series panel meters offer many features and performance capabilities to suit a wide range of industrial applications. These meters accept thermocouple or RTD inputs. 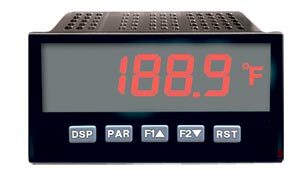 The meters provide a maximum and minimum reading memory with programmable capture time. The capture time is used to prevent detection of false max or min readings which may occur during start-up or unusual process events. These meters have been specifically designed for harsh industrial environments. With NEMA 4X (IP65) sealed bezel and extensive testing of noise effects to CE requirements, the DP63400 Series meters provide a tough, yet reliable, application solution.